Beyond that, everything comes together in a flash, and good pasta salad is always a crowd pleaser. I've added some alternate suggestions below as well, building on the general concept. Enjoy! Lentils: I was disappointed that I didn't have any black lentils cooked and on-hand, because I would have added those for the added substance and nutrition boost. If you have some, add them! Almonds: Whole toasted almonds - yes for the crunch, and everything else that makes almonds delicious. 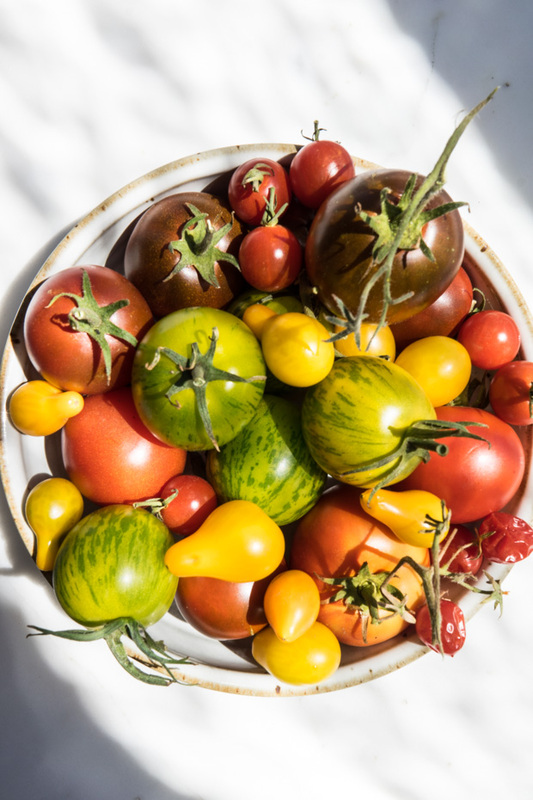 You don't really need any of these, the whole thing is good without (especially if your tomatoes are on point), I guess what I'm encouraging is a bit of latitude when it comes to add-ins and flare. You could even make a nice, clear, garlic broth, and pour it over a bowl of leftovers for a beautiful soup. Make the dressing by toasting the caraway in a dry skillet just until fragrant - a minute or two, tossing regularly. Transfer to a mortar and pestle, and crush the seeds. Add the garlic, and the salt, and crush into a paste. Work in the harissa, followed by the lemon juice, and then the water, eventually the nutritional yeast, and tahini (if using). Taste and add more salt if needed (I sometimes add a bit of sweetness at this step too if the lemon is too assertive). Just before serving pour 1/3 of the dressing over the kale and toss well. Add the pasta, another third of the dressing, and toss again. 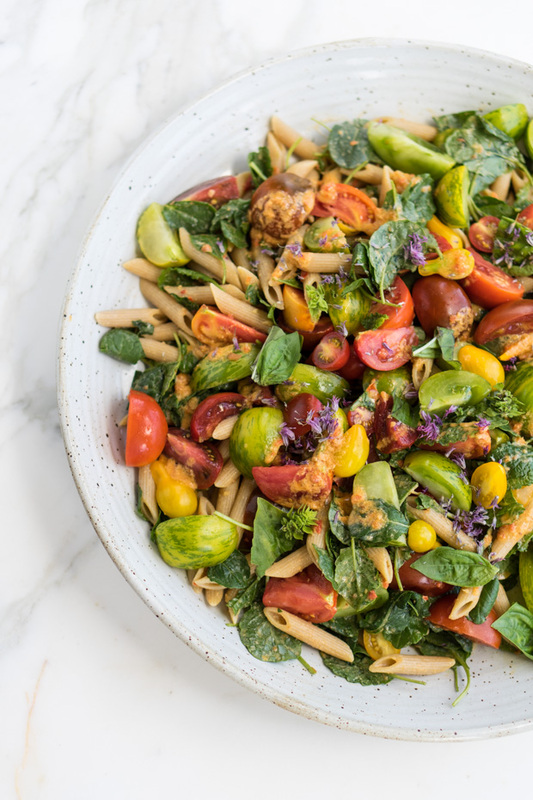 Arrange the tomatoes, and basil on top of the kale-pasta, and give the gentlest toss, being extra nice to the tomatoes. Drizzle with the remaining dressing, and top with any of the suggestion extra toppings. Enjoy!